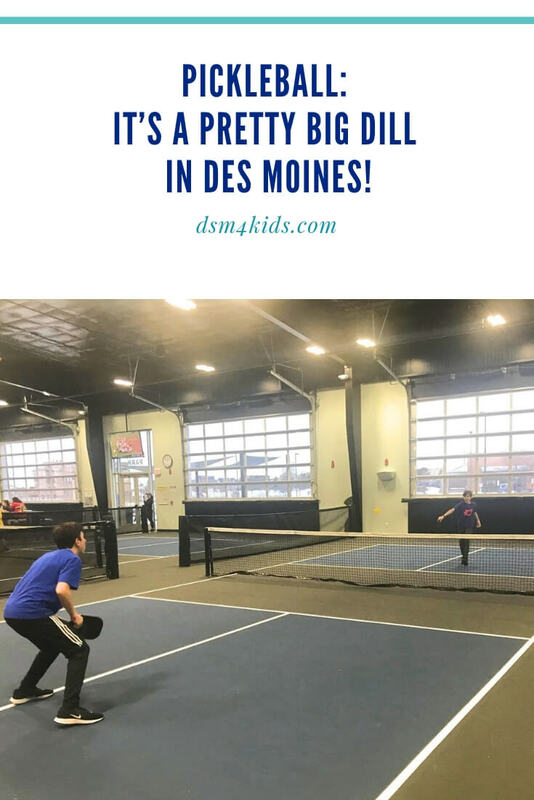 Pickleball: It’s a pretty big dill in Des Moines! Move over tennis and golf. There’s a new game in town. It’s called pickleball. Des Moines is seeing clear evidence of this explosion, and demand for pickleball courts, as players of all ages discover the fast-paced, fun game with a funny name. So, What Exactly Is Pickleball? Pickleball is a hybrid sport that combines elements of tennis, badminton, and ping-pong. It’s played indoors or outdoors on a badminton-sized court with a minimally-modified, slightly lower tennis net, and equipment includes solid paddles like ping-pong and plastic balls similar to wiffle balls. The game can be played with two single players or more commonly with doubles teams. The sport is very popular with the senior set and is quickly becoming popular with kids as they play it in P.E. Pickleball offers great low-impact exercise. It’s also a great social sport and the equipment cost is inexpensive, with paddles starting at $30 and a can of balls is around $10. Four Mile Community Center hosts Open Gym Monday through Friday from 12:00 to 8:00 pm. Pickleball, as well as, other sports can be played during this time. The Center has pickleball paddles and balls available, or you can bring your own. Pickleball can be played year-round Monday through Friday 8:00 am to 12:00 noon at Pioneer Columbus Recreation Center. All ages are welcome to play in the east gym. $2 per person. In addition, Evening Pickleball is offered on Monday and Wednesday from 6:00 to 8:00 pm, March through September. Smash Park has eight pickleball courts (6 indoor / 2 outdoor) and offers leagues, clinics and lessons for all ages and skill levels. They also host local, regional and charity tournaments. You can bring your own equipment or rent it from them, if you just want to try it out. Courts are available for rent: Monday through Thursday $20/hour and Friday, Saturday and Sunday $30/hour. Open Play is also available: Monday through Friday 8:00 to 11:00 am $3/person; Monday through Friday 11:00 am to 5:00 pm $5/person; Saturday 8:00 to 11:00 am $5/person. Pickleball can be played on one of Valley Community Center’s six courts on Monday, Wednesday and Friday from 8:00 am to 12:00 noon. The cost to play is $1. Players of all skill levels are welcome. Many local fitness centers, like YMCAs and large churches also have Pickleball courts. Some are for members-only, others charge a fee to non-members for court usage. Find a list of local fitness centers here. Pickleball courts can be found at parks throughout the Des Moines metro. They’re typically lined out on existing tennis courts. Find a list of Des Moines area Park and Recreation Departments here. Does your family enjoy playing Pickleball in Des Moines? If so, where?